It goes so fast. Everyone says it, typically folded in with some “cherish every moment” drivel that I never feel like listening to because “every moment” includes the times I’m chiseling dried puke out of the crevasses of the car seat or carrying my kicking, howling child out of Target, but it really does go so fast. And damned if that’s not true. The days are long; the hours are longer. Two weeks ago, when one and then the other of my girls had the flu, the hours were impossibly long. I slept fitfully next to them, waking up every hour to take their temperature, check their breathing, coax them awake to swallow some Tylenol. The nights when Ruby and I fight over her math homework seem endless; the days of thick dread spent waiting for a doctor’s appointment seem eternal. And yet, somehow, my girls are not babies anymore and it seems to have happened in the proverbial blink of an eye. Ruby is almost a teenager, two-thirds of the way to a legal adult. Georgia is 6 – almost 7 – and even though I still call her “my baby” and can’t bring myself to part with her hooded towels, she can read and write and play soccer in PE class. Not only does it seem like their growing up is going too quickly but also like mine went too quickly. Ruby had a sleepover last weekend, and as I heard them giggling in her room over boys, it was hard for me to wrap my brain around the fact that I couldn’t just plop down on her bed with a bowl of chips and join in the fun and demand that they French-braid my hair. 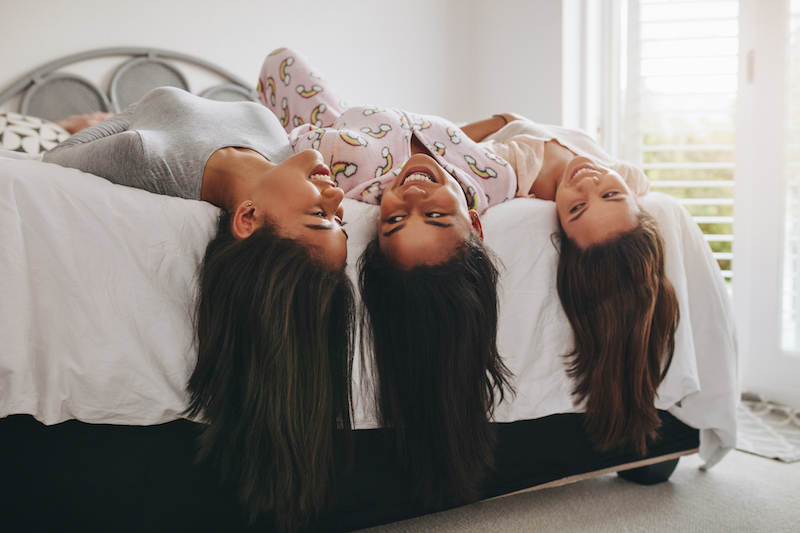 “How did I become the mom in this scenario?” I wondered, even though I know logically that I am 38-and-a-half years old and my sleepover days are far behind me. I heard myself saying mom things – “clean up your mess out here, girls!” and “after all that candy, PLEASE do not go to bed without brushing your teeth!” and “I am going to bed, ladies, so please don’t stay up too late!” – but I just also felt like my own tween sleepover experiences were not so far behind me, as though they were just beyond the veil and somewhere, in an alternate reality, I was still whispering a ghost story to my BFF Morgan while my other BFF Kelly paged through a “Tiger Beat” with Luke Perry (RIP) on the cover and we discussed whether we’d stop at Sbarro for pizza before or after we went to Claire’s the next day at Lakeside Mall. While I was putting some clothes away in Ruby’s room (and eavesdropping), I also had a brief illusion that I was a “cool mom” and that maybe they’d invite me to stay and listen to the gossip for a bit, but then one of them said, “Oh, yeah, I totally ship them,” and I said, “What does ‘ship’ mean?” and they both looked at me and Ruby rolled her eyes and the bubble burst. I was just a middle-aged mom again, wearing glasses and sweatpants emblazoned with the name of my college and trying too hard to fit in. I put the rest of the shirts away and hurried out of her room to go drown my sorrows in cheap white wine and a mystery novel on my Kindle, like all the cool people do on Saturday night. But if the bad news is that I’m getting old, the good news is that I’m not doing it alone. Morgan and Kelly are both boring old moms too now, although their kids are younger and not quite to the sleepover stage, and I sent them Facebook messages that night.